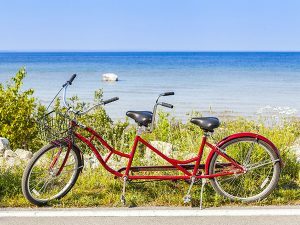 On Saturday 14 October, Tim Wheatley and Dave Green, members of the Fordingbridge Twinning Association, will be riding a tandem from Le Havre to Vimoutiers to mark the 35th Anniversary of the Twinning between the towns of Fordingbridge and Vimoutiers. Tim first visited Vimoutiers as a boy before the official twinning charter was ever signed, when Fordingbridge Football Club visited their counterparts in Vimoutiers for a friendly tournament. He has been visiting Vimoutiers with his family regularly ever since. On the occasion of the official signing of the twinning charter, 6 people from Fordingbridge rode to Vimoutiers from Le Havre on tandems to celebrate the arrival of Fordingbridge. Tim and Dave will follow the same route as the one used in 1982.